Every once in a while, I come across a really unpolished gem. A musician, who’s completely unaware of how brilliant his songs and song ideas are – Marc is such a gem. A few years back, he asked me to sing on his debut EP, and back then I was blown away, by how great his melodies and songs are. Told him back then, if he ever gets to do a proper full length album, to please contact me again. I offered help in every possible way, and here we are now. 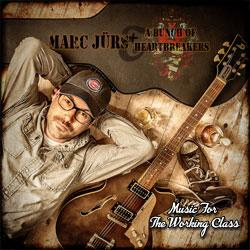 “Music For The Working Class” is a wonderful singer/songwriter style album with brilliant hooks, thoughtful lyrics and a line up you could only dream of! See below! So proud of you, Marc.